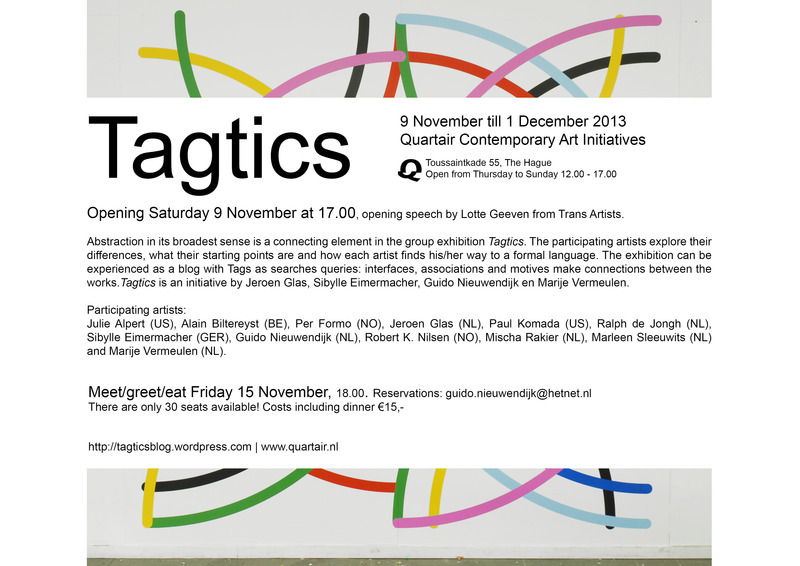 In case you missed it, the opening of the Tagtics exhibition @ Quartair for you in pictures! The crowd listening to Erik Jan Ligtvoet, one of the Quartair artists, in the front the cube piece of Mischa Rakier. Lotte Geeven officially opened the show with a great lecture about the importance for an artist to travel! The crowd was pleased and listening carefully behind the fragile work of Ralph de Jongh. Mischa Rakier and Lotte Geeven in front of the bar, painted by Marije Vermeulen. On the right the Happy Painter is looking at his work in the corner as a satisfied man. On the floor a work by Paul Komada. The corner painting already had fans. There was fresh soup and bread enough for everyone. Marije, Mischa, Robert and Paul. Robert Nilsen from Trondheim next to his work.